Desired Launch Dates: Please offer Sunset Bay a least two options for scheduling purposes. Sunset Bay Marina (SBM) requires all balances to be paid in full prior to confirming a launch date. Boats not scheduled will not be launched. The SBM Office will email or call to confirm your launch date at least 3 days prior to launch. If you do not receive a confirmation, please contact us. We require at least 7 business days’ notice to schedule a launch date. If service is requested, please allow at least two weeks’ notice for your requested launch date. SERVICE WILL NOT BE DONE SAME DAY. An inspection will be done on the boat prior to splashing. If any damages are found and the owner is not present during launch, a call will be made immediately to the Owner(s). After the boat has left SBM we are no longer responsible for any damages. Usage of a slip is allowed for 48 hours at no charge. After 48 hours, a charge of $35 a day will be incurred for slip usage. If the boat is not removed after 5 days, a fee of $50 a day will be incurred. Our daily transient slip fee is $35. 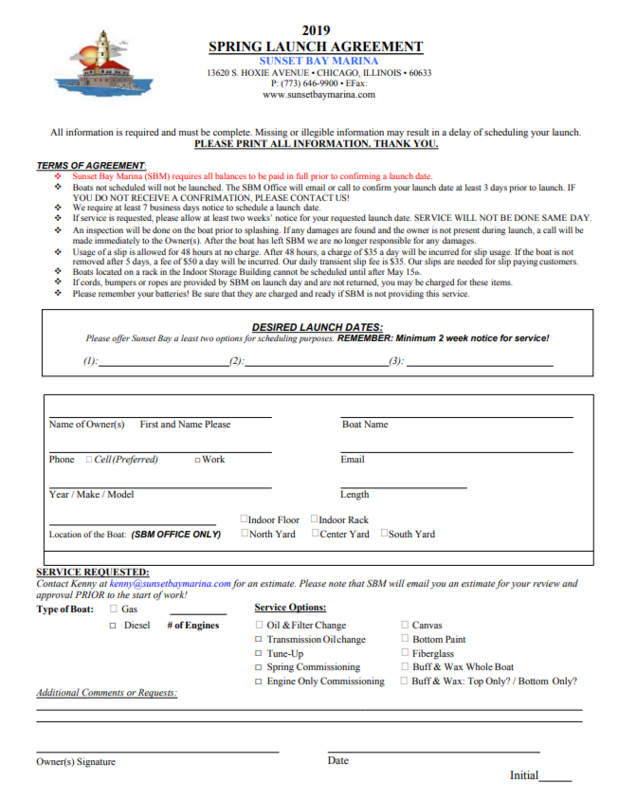 Our slips are needed for slip paying customers. Boats located on a rack in the Indoor Storage Building cannot be scheduled until after May 15th. If cords, bumpers or ropes are provided by SBM on launch day and are not returned, you may be charged for these items. Please remember your batteries! Be sure that they are charged and ready if SBM is not providing this service. Download and print Sunset Bay Marina’s 2019 spring launch agreement. Simply, click on the image to download and/or print.